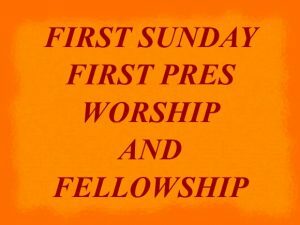 At the Single 10:00 a.m. Worship Service you will be able to catch up with all your First Pres friends. The service will feature a unique order of worship with elements from our other services such as: several opening songs with our Praise Band, the Young Praise (middlers), a traditional anthem, children’s music, Sermon, Time with Younger Disciples, and a closing music by one of our ensembles..
At 11:15 a.m., we hope you continue fellowship with our First Pres family and friends, with a Congregation-wide Fellowship Luncheon in McLeod Hall. No reservations requested or required. There will be plenty of food. Any leftovers will be used by our Saturday Soup Kitchen. We hope you will join us for this great day of faith, friendship, and fellowship on December 2.